There is a distinct feel in the air now that summer is drawing to a close – the humid restless nights are now gone and we are back to sleeping under our sheets not over them, there is a definite autumnal crispness and clarity to the air, and I even slipped on a pair of socks this morning – the first time in months I have felt the need! So this morning when I looked at this photo from a past holiday, it automatically made me think of the last days of summer. 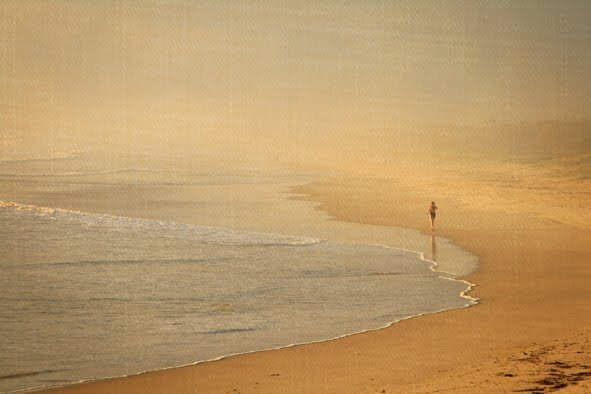 Maybe it’s the woman walking from the golden sand to the dusky seahaze in the distance, like the transition between summer and winter. Maybe it is the faded vintage feel, like times that have now passed. Maybe it is both. But whatever it is, it is like a mental switch has been flicked, and that my sights are now on autumn. Do you feel the same – or maybe spring is arriving where you are? Spring is being a bit of a seductress right now – offering tempting glimpses of what could be, but nothing concrete. Snowdrops, narcissus and crocuses are finally out – two weeks late! – but I'm still cuddled up to the radiator as I sit here writing. Spring bulbs are lovely aren't they? Partly because of their beauty, but also because they signify the end of winter! Your photo is so serene looking.